Aglio e Olio for lunch, July 2017. This is a simple pasta packed with life force yet you can make it even if you have only pantry staples on hand. The only requirement is that what you use is really high quality. 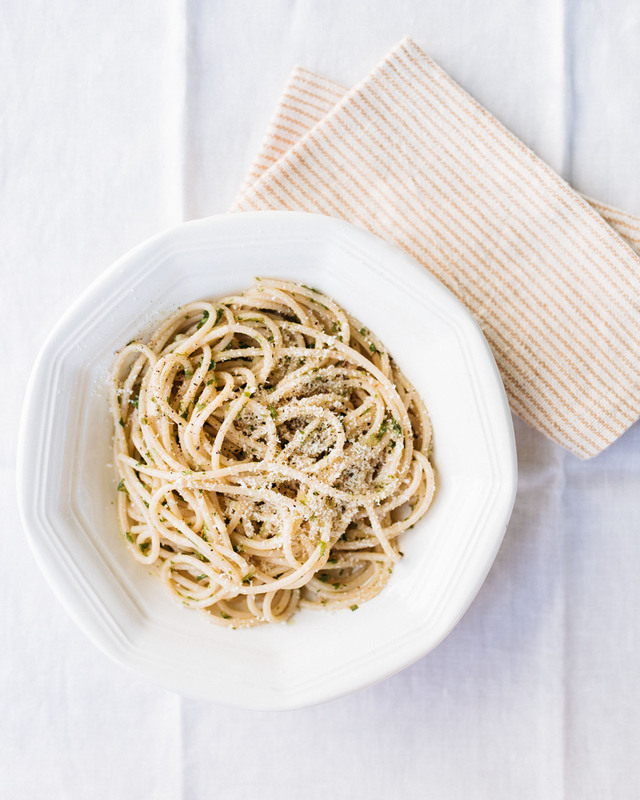 Aglio means garlic and olio means oil, that is, olive oil as the recipe is from Italy. You cook garlic in olive oil and combine the aromatic sauce with spaghetti. That is Aglio e Olio in a nutshell, although I often make the recipe a tiny bit more complicated by adding dried red pepper flakes and fresh herbs to the sauce – and serving the dish with Parmigiano and black pepper. Bring a large pot of water to a boil, then salt the water heavily. When the salt has dissolved, add pasta and cook until al dente. Cook over medium heat for a few minutes, add minced herbs and remove pan from heat. Do not let garlic turn golden or brown. When pasta is ready, transfer it to the saucepan and combine well. Mix in a little more olive oil for freshness. Serve with freshly grated Parmigiano and black pepper from the mill, if desired.